I started working with Winston, a recently adopted Terrier mix from Danbury Animal Welfare Society in Danbury CT. Shortly after adopting Winston, his family got their new puppy Destin, a Red Golden Retriever. 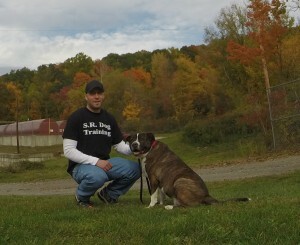 For Destin, we focused on puppy training in Danbury CT. Both Winston and Destin are terrific dogs with an amazing family! As part of my in-home puppy training program, we are focusing on Destin’s housebreaking, puppy jumping and biting (which are VERY typical issues for puppy owners), leash walking, and her obedience training. 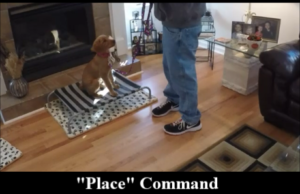 Destin is an extremely smart Red Golden Retriever puppy and she is excelling at my training program. The obedience commands we have started teaching her are: Sit, Down, Come, and Place (which teaches her to go to her dog bed to relax), and Free (release command after “Stay” command). One of the greatest determining factors of a well-behaved adult dog, is early puppy training. Puppies, just like children, are learning every day. Regardless if we think we are teaching them or not, they are absorbing everything we do. Therefore, it’s best to teach correct and appropriate behaviors now. It’s much easier to lay a solid foundation as a puppy, than it is to go back and address issues later on. My program for puppy training in Danbury CT focuses on simple, safe, and effective techniques to help you and your dog. Puppy training should not take you a lot of extra time and effort. In one two short 5-10 minute training sessions per day, Destin’s family was able to achieve this great progress.